As a new cloth-diapering mom beast and blogger, I woke up this morning with a sense of obligation to write about our experiences with cloth so far. And why not? It's a blog post--which we all know I haven't been awesome about lately--and it helps make cloth a smidgen more mainstream. And cloth being mainstream makes me happy. Like any other person, these things seemed daunting at first. I did a lot of reading before finally jumping in. Here is how I got past those four scary things and chose to embrace cloth diapers. Scary Idea #1: Choosing to cloth diaper is way too expensive upfront. We opted to start with three different brands (four covers per brand) and a bunch of different inserts. By month three, we have picked our favourites and are ready to expand our stash, but our initial stash cost only $350. You basically get back your return on investment in the first three to four months. Choose diapers that will grow with baby. Choosing a one-size diaper will save the added expense of upsizing later on. All-in-two's will ultimately save you money. The glorious thing about all-in-two diapers is you can reuse the covers if a diaper is wet and not soiled, and just replace the insert instead of throwing the whole thing in the wash. You can save a ton by stocking up on more inserts than covers, and extend the life of your covers by doing so. Scary Idea #2: Cloth diapering is way more complicated. 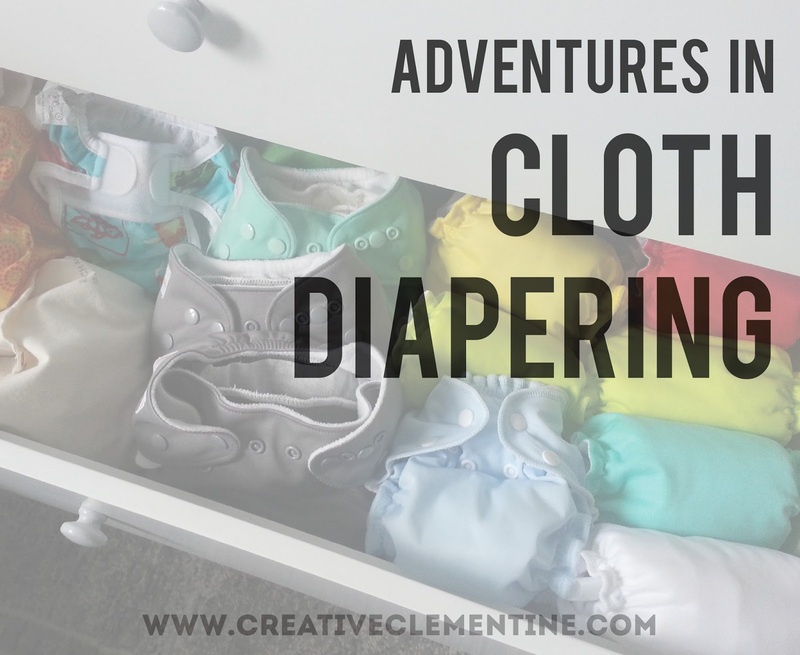 We started cloth diapering at six weeks, after giving ourselves the chance to get used to having a baby at all for the first month or so. After we were in the habit of changing him in his nursery, the transition to cloth was barely even a problem. Pre-stuffed diapers for a grab-n-go system. I'm not going to pretend that it is exactly the same process to grab a cloth diaper from the drawer as it is a disposable. I can admit that. But having the top drawer filled with diapers that are ready to go is a great way to not hate the process of cloth bum changes. Embrace convenience for the diaper bag. If you choose to use cloth while out and about, make it easier by using the one-piece inserts (rather than trifolds) so you have slightly less bulk in your diaper bag and save yourself a few seconds during diaper changes. 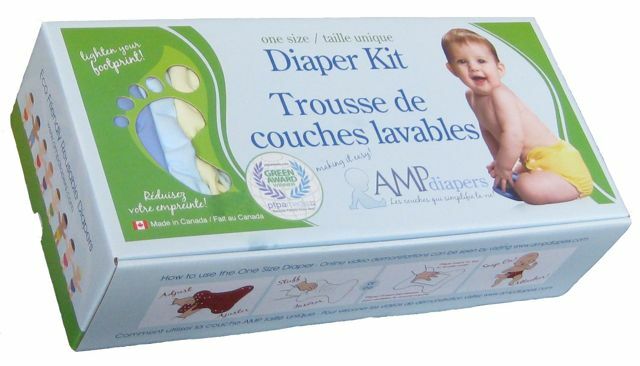 Or if you are like a lot of other cloth moms, have disposables on hand just for outings. Scary Idea #3: Cloth diapering means getting disturbingly up close and personal with your baby's poop. Again, this is a little bit true and a lotta false. Did you know disposable diaper packaging actually says to discard solid poop in the toilet? Yup. So having to "shake off solids" into the toilet with cloth diapers isn't any different than what people are supposed to do with disposables. And really, if you don't "do poop", you might be heading down the wrong path. Babies = poop. Diaper liners. Using a flushable diaper liner will keep at least some of the poop (solid or otherwise) out of your washing machine and help prolong (inevitable) staining for at least a little while. A poop disposal system. We have a compost container within arms reach of the change table for poopy diaper liners. This saves us from having to run back and forth to the bathroom carrying anything nasty in the heat of the moment. Instead, we just make a trip a couple times a day when it works for us. Scary Idea #4: Cloth diapering is "abnormal" and makes you a social pariah. For some reason, when people learn I'm both an exclusively breast-feeding (ebf) mom and using cloth diapers, they assume I'm going to get all weird on them. Suddenly they perceive holes in all of my perfectly valid arguments and topics of conversation. I recently had to stifle a laugh when someone tried to "come down to my level" about amber bracelets, and suggested (in a kindergarten teacher voice) that I think the amber gives off an aura (insert hilarious twinkly hand motion here) that makes baby more at ease and therefore less fussy. Nope. Just because I cloth diaper does not mean I am also parenting based on magic and joojoo. Cloth diapering and ebf are not gateways to witchcraft. Jus' sayin. Anyways. I found that seeking out people on instagram using the hashtag "#makeclothmainstream" found me a lot of cloth-bum mom allies. There are also Facebook groups if you are looking for a sense of community--some national, some local. One more thing I found was that openly posting photos with my kid's cloth diaper showing led to people messaging me to say, "Me too!". So, just be open about it and your lonely island of cloth solitude will be a bustling spring-break destination in no time. Do you have any tips or tricks for fearlessly cloth diapering? I'd love to hear about it in the comments!